From setting the ambience to complementing the theme of the celebration, the wedding venue plays an important role in making your big day a memorable one. However, with the wide variety of wedding venues in Singapore to choose from, selecting the perfect one is an understandably daunting task. Whether you’re the midst of your search or your wedding planning journey has just begun, here are 5 tips for choosing the ideal venue. Ideally, the venue should allow ample space for your guests and you to mingle, dine and dance. For hotels, pillarless ballrooms are recommended to ensure unobstructed views of the ceremony and to have the room feel more spacious. Most wedding venues often host more than one event at a time. As such, consult your wedding planner/coordinator on the events that may be held during the same period as your big day and if they may affect your celebration. Otherwise, opt for an alternative and more intimate venue that ensures you more privacy. Nothing says romantic like tying the knot against the backdrop of a sunset or under the stars. From a waterfront wedding to a ceremony that’s surrounded by lush greenery, there’re plenty of outdoor wedding venues in Singapore that boast spectacular views. While important, a wet weather plan is advised, just in case it rains on your parade. Common perks include free-flow beverages, wedding invites, complimentary parking coupons or even staycations for the newlywed. 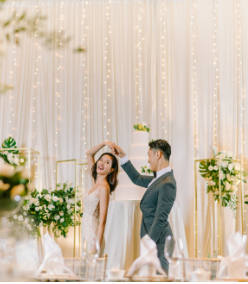 While these perks are usually offered by Singapore wedding hotels, check in with your wedding venue on the perks that you may be entitled to. Often, these terms can be negotiated with your wedding venue coordinator. Especially so for alfresco weddings, having an alternative plan is always recommended. After all, nobody likes being rained on their parade. Simply consult with the wedding planner/coordinator on how you can best plan for an alternative. Whether you’re looking at a grand wedding or an intimate celebration, the above tips will assist with choosing the most suitable wedding venue.